Just had this “Sponsored Story” pop up when I signed in to Facebook. 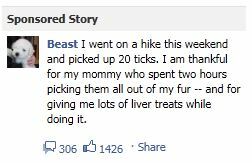 Yes, that’s Beast… yes, Mark Zuckerberg‘s d og. Either Mark (or his girlfriend) is bored or Sponsored Stories aren’t quite selling as well as Facebook had hoped. Either way, I’ll admit that I keep up with that little pup’s shenanigans. I really hope it’s actually Zuckerberg writing the copy/taking the pics, because I’ll just cry if it’s actually some intern. The K-9 already gets more engagement on his posts than most brands could hope for. I think it’s a little unfair he also has unlimited access to Facebook’s marketing platform as well.